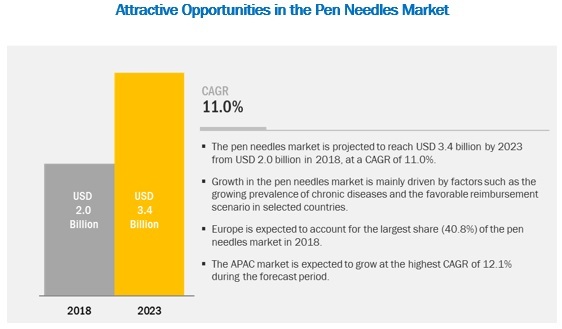 [144 Pages Report] The pen needles market is expected to reach USD 3.4 billion by 2023 from an estimated USD 2.0 billion in 2018, at a CAGR of 11.0% during the forecast period. Growth in the pen needles market is mainly driven by factors such as the growing prevalence of chronic diseases and the favorable reimbursement scenario in selected countries. The growing preference for biosimilar drugs is another factor providing a wide range of growth opportunities for key players in the market. Based on type, the market is segmented into standard and safety pen needles. In 2018, the standard pen needles segment accounted for the largest share of the pen needles market. Growth in this market is associated with the low cost of standard pen needles. On the basis of therapy, the pen needles market is segmented into insulin, GLP-1, growth hormone, and other therapies such as osteoporosis, fertility, and obesity. The insulin therapy segment is expected to grow at a higher CAGR during the forecast period primarily due to the high and growing diabetic population globally. On the basis of length, the market is segmented into 4mm (5/32’’), 5mm (3/16’’), 6mm (1/4’’), 8mm (5/16’’), 10mm, and 12mm (1/2’’). In 2018, the 8mm segment accounted for the largest share of the pen needles market. Growth in this market is largely driven by the high adoption of these needles among diabetes patients. Europe dominated the pen needles market in 2018. The large share of the European pen needles market can primarily be attributed to the high diabetes expenditure and reimbursement in Germany, NHS support and access to pen needles at a subsidized cost in the UK, high insurance coverage in France, and supportive regulations in Spain. The key players in the pen needles market are Becton, Dickinson and Company (US), Novo Nordisk A/S (Denmark), and Ypsomed Holding AG (Switzerland), B. Braun Melsungen AG (Germany), HTL-STREFA S.A. (Poland), Terumo Corporation (Japan), and Owen Mumford (UK). Becton, Dickinson and Company is a leading company in the field of drugs delivery systems. The company is a pioneer in the field of pen needles. The company operates in the US, Europe, EMA (which includes the Commonwealth of the Independent States, the Middle East, and Africa), Greater Asia, Latin America (which includes Mexico, Central America, the Caribbean, and South America), and Canada. The company has a strong product portfolio and focuses on product launches. For instance, the company launched BD Ultra-Fine micro pen needle 6mm x 32G and BD AutoShield Duo in 2017. Novo Nordisk is among the leading players in the diabetes market. As a significant volume of Novo Nordisk’s insulins are used in injectable devices, the company is witnessing a surge in the sale of its insulin pens and supplies including pen needles. The company has its distribution and production facilities in more than 75 countries and markets its products in more than 180 countries. Novo Nordisk has strategically placed its facilities in five countries across four continents. The company focuses on spreading awareness about diseases through campaigns. For instance, in 2018, Novo Nordisk UK launched a campaign to raise awareness of the risk of heart attacks and strokes in people living with type II diabetes. In 2018, Becton, Dickinson and Company (US) launched its BD Ultra-Fine micro pen needle 6mm x 32G in the market. In 2016, Ypsomed (Switzerland) entered into an agreement with Tonghua Dongbao Pharmaceutical (China) with an aim to distribute its mylife Clickfine pen needles in China. In 2015, Ypsomed (Switzerland) launched mylife Clickfine DiamondTip pen needles. Emerging countries have immense opportunities for the growth of the pen needles market, will this scenario continue? What are the challenges hindering the adoption of pen needles? The study involved four major activities to estimate the current market size for pen needles. Exhaustive secondary research was done to collect information about the market, peer markets, and the parent market. The next step was to validate these findings, assumptions, and sizing with industry experts across value chain through primary research. Thirdly, both top-down and bottom-up approaches were employed to estimate the complete market size. Finally, the market breakdown and data triangulation was used to estimate the market size of segments and subsegments. In the secondary research process, various secondary sources such as the WHO, International Diabetes Federation, World Bank, Global Burden of Disease Study, Food and Drug Administration, American Diabetes Association, American Association of Diabetes Educators, Centers for Disease Control and Prevention, Diabetes Canada, Statistics Canada, European Association for the Study of Diabetes, European Society of Endocrinology, Diabetes UK, National Health Service, OECD Health Statistics, Asian Association for the Study of Diabetes, ASEAN Federation of Endocrine Societies, Statistical Handbook of Japan, OECD Obesity Update, Brazilian Diabetes Society, Latin American Diabetes Association, directories, industry journals, databases, press releases, and annual reports of the companies have been used to identify and collect information useful for the study of this market. In the primary research process, various sources from both the supply and demand sides were interviewed to obtain qualitative and quantitative information for this report. The primary sources from the supply side include industry experts such as CEOs, vice presidents, marketing directors, technology and innovation directors, and related key executives from various key companies and organizations operating in the pen needles market. The primary sources from the demand side include personnel from research organizations, academic institutes, and purchase managers. Becton, Dickinson and Company (US), Novo Nordisk A/S (Denmark), Ypsomed Holding AG (Switzerland), B. Braun Melsungen AG (Germany), HTL-STREFA S.A. (Poland), Terumo Corporation (Japan), Artsana S.p.a (Italy), Owen Mumford Ltd. (UK), Allison Medical, Inc. (US), UltiMed, Inc. (US), ARKRAY, Inc. (Japan), and GlucoRx (UK). This research report categorizes the pen needles market based on type, needle length, therapy, mode of purchase, and region.